Recognized as one of Latin America's most important artists, Armando Morales combines visions of his homeland with subconscious fantasy, creating canvases of enigmatic beauty. For the past five decades, Morales has experimented with abstraction and figuration, developing a signature style which bridges the divide between these two divergent approaches to painting. Throughout Morales's work, there is a persistent investigation of the same subjects depicted in similar chromatic tones. 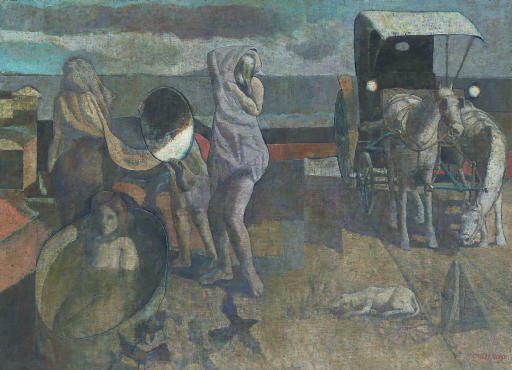 The many female bathers, horses, dogs and birds that inhabit Morales's dreamscapes are always rendered in dark shades of blue, green, gray, purple and red. Almost all of Morales's canvases also share a distinct textural surface; the result of the artist's laborious working method involving layering and scraping of paint followed by a beeswax varnish. Surprisingly, this consistency has not produced a monotonous body of work. Morales's early and late paintings continue to intrigue and propose new and complex questions to the viewer. Sueño: tres bañistas, coche, perro, enana sosteniendo un espejo, pájaros, is a classic example of Morales's more recent explorations of his favored themes. The three bathers and their companions appear in front of a body of water most likely meant to recall the grand Lago de Nicaragua bordering Morales' hometown of Granada, Nicaragua. The faceless bather at center seems an evocation of the past; columnar-like in her pose, she is reminiscent of a caryatid. The inclusion of the horse and buggy here, in a twenty-first century painting, also alludes to a bygone era. These anachronistic images create a sense of timelessness encountered only in dreams, as the title of this work suggests. Within this imaginative scene also stands a female dwarf supposedly holding a mirror which covers her face. Rather than reflecting the world beyond the canvas, however, this mirror remains opaque, revealing only a shadowy surface with white highlight. Alongside this small figure appears another mysterious bather whose face remains obscured by the cloth which connects them. These unexpected juxtapositions recall the work of the Surrealist painter Giorgio de Chirico, whom Morales considers a significant influence. As Morales stated, "For a long time I have had a great affinity for De Chirico's work although I never borrow specific elements from it. Nonetheless I suppose that such motifs as the portions of classical buildings, trains or shadowy figures are at least partly indebted to my admiration for de Chirico. "(1) In addition to their shared motifs, there is also a quiet stillness to both artists' images, which leads their viewers toward contemplation. It is through this meditative process that the layers of meaning beneath Sueño: tres bañistas, coche, perro, enana sosteniendo un espejo, pájaros can begin to be uncovered. 1) Armando Morales in E. J. Sullivan, "Armando Morales: Southern Visions of the Mind," Arts Magazine, 62:3, November 1987, p. 64.